PRODUCT: 2" QUIK DRIVE PLASTIC COLLATED SCREWS. YELLOW ZINC FINISH. SQUARE DRIVE IN STRIPS OF 30. 2000 SCREWS/BOX. PRICE/BOX. QTY LIMITED. SPECIAL SALE PRICE. DESCRIPTION: Features: Convenient plastic collated strips hold 30 screws Simple loading procedure requires no adjustments or threading -- just snap a clip in and go!! Head: Type Square Length: 2" Shank Diameter: #8 Course Sharp Shank Finish: Yellow Zinc Box Quantity: 2,000 Shipping weight 19.50 lbs Versatile QuikDrive Systems feature QuikStrip screws that are available for most construction applications including subfloor, drywall, decks, and metal roofing. 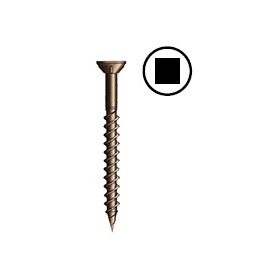 QuikStrip screws eliminate nail-pops and warped boards with the superior holding power only a screw can provide.